Youness is a Senior Software Developer in Canada with over a decade of experience in Java development. He has utilized Java stack to grow numerous companies in a variety of industries such as Telecoms, ERP systems and Mobile Banking. After achieving the highest score to enter the university for Software Engineering at 2003, he commenced to think in Java. Beside the analysis and development of software systems, consulting software policies and teaching software techs, he has focused on Java technology and software development practices. He is currently active as a Software Developer at Aimsio. The company is delivering Field Service Managment software solutions on a cloud platform that provides executive dashboards and field ticketing systems for medium level to big companies with field services. These companies are active in a veriaty of industries including Construction, Oil & Gas, Hauling, and etc. If you'd like to become more familiar with Youness, you can checkout his Linkedin profile at here. Please feel free to ask any question by sending an email, leaving a Linkedin message or a simple comment below. 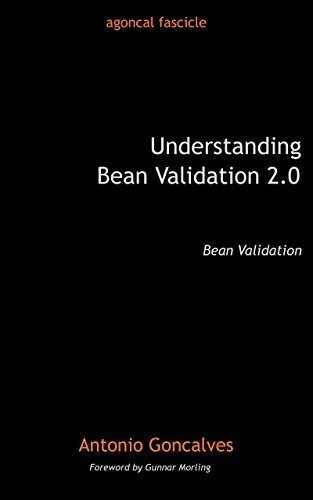 Understanding Bean Validation 2.0 is written by Antonio Goncalves, the senior software architect in Java/Java EE and the Java Champion and I had the honor to be a proof reader of the book. This is a step by step guid to to centralize the validation constraints in one place and share them across different layers to minimize the cost and effort of validating user requests. Beginning Java EE 7 is the first or one of the first books on Java EE 7. It is written by Antonio Goncalves, the senior software architect in Java/Java EE and the Java Champion. In 2013, I had the honer to coauthor chapter 12 on XML and JSON Processing in this book. Thanks to Antonio Goncalves for this great book and also for his kind acknowledgement in the book. Beginning Java EE 6 Platform with GlassFish 3 From Novice to Professional is written by Antonio Goncalves, the senior software architect in Java/Java EE and the Java Champion. I was one of the people who had the honor to cooperate with Antonio to improve the book for the second edition, published in 2010. Big thanks to Antonio Goncalves for his great book and also for his kind persuasions and acknowledgement in the book (, ,etc.). Aimsio is delivering Field Service Managment software solutions on a cloud platform. This platform provides executive dashboards and field ticketing systems for medium level to big companies with field services requirements. These companies are active in a veriaty of industries including Construction, Oil & Gas, Hauling, and etc..
With more than a decade of experience in Information Technology, Atieh Dadeh Pardaz has concentrated its activities on providing solutions based on SMSA and Mobile Banking. It is currently one of the most capable companies in text message bulk services as well as value added services. Using dedicated, skillful forces as well as utilizing state of art technology, ADP has been able to reach a unique status in provision of specialized variegated services among other competitors. MobinOne is a joint venture firm, established by two leading companies in the Telecommunication industry (Iran Mobin and One Italia) delivering Value Added Services for the Telecommunication industry, for 2G/3G standards and land-lines. With about 500 employees, solutions offered by TOSAN are a combination of banking products and services that allow banks and other financial institutes to apply the latest technology in the world to mix with their banking services. Tosan as the first banking solution provider in Iran, owns the latest banking knowledge with regards to its experience of cooperation with about 23 banks and institutions over a decade. DOURAN provides software, networking and hardware solutions with more than 300 employees in five groups of ERP, Security, VoIP, Portal and School. DOURAN ERP solution is one of the complicated ERP systems with diverse sub-systems. BehPardaz Software Engineering Group was an affiliation of engineers and university students which was established by me on 2006. The foundation of the group originated back from CREG (Computer Research Engineering Group) which was a research group made up of QIAU talented students. Health Care Systems Analysis and Hamyar Mechanic software were two main areas that the group was devoted into. CloudSim is an open source framework for modeling and simulation of cloud computing infrastructures and services, written in Java by CLOUDS Lab under the direction of Dr. Rajkumar Buyya. CloudAuction is a package that I developed for CloudSim to enable it handling auction based services. The new market mechanism in CloudAuction helps it to allocate services to participants efficiently based on the Combinatorial Double Auction Principle with the relevant attributes applicable in cloud computing environments to the benefit and satisfaction of both users and providers. The package can be downloaded from CloudAuction section in CloudSim website or directly from here. Cooperation with Dr. Elankovan Sundararajan, the head of Industrial Informatics Program at UKM university, in FTSM Lab on a grid computing project on 2011. How to install and setup a BOINC Server on an Ubuntu Server. How to setup a project on a BOINC Server. How to create and setup an application on a BOINC project. To avoid complexity, I have omitted some extra explanations about some steps that are common to a normal Linux user. Please be patient while going through the steps. Designing an optimal market-based resource allocation that considers the benefits for both the users and providers is a fundamental criterion of resource management in distributed systems, especially in cloud computing services. Most of the current market-based resource allocation models are biased in favor of the provider over the buyer in an unregulated trading environment. In this study, the problem was addressed by proposing a new market model called the Combinatorial Double Auction Resource Allocation (CDARA), which is applicable in cloud computing environments. You can download the paper directly from here. If you are more interested, please checkout my LinkedIn post about this paper and how to downoad the simulator. This project was focused on improving the Linux Kernel scheduling algorithm. The project is consisted of object-oriented implementations of WFQ, VTRR, and our newly revised Extended-VTRR scheduling algorithm on a sophisticated simulator that is designed and implemented on Java platform. Besides, we embeded the VTRR and Extended-VTRR algorithms into Linux kernel 2.4.19 to evluate the improved performance in action. The original VTRR simulator is available to download from here . I have left a background of myself at here for those curious people who are interested to have an idea of a simple path to start software development with the goal of enterprise software development in place. Besides, some individuals, startups, or companies might be interested to know more about how I started my software engineering path and the way I look at problem-solving in Enterprise Software Development. Unfortunately, it is not possible to keep this background updated so please accept my apologies for that. JAVA Line is a systematic introduction to Java EE 6 concepts for those who are familiar with Java Enterprise concepts. Besides, it is a collection of fast tips to be referenced quickly by Java Enterprise developers. Currently, Java Line covers one of the main aspects of JEE which is Java Persistence API (JPA). JPA provides a POJO persistence model for object-relational mapping. It can be used directly by web applications and application clients, and even outside the Java EE platform, for example, in Java SE applications. Please subscribe to get the latest updates. The courses are held in two levels, Basic and Advanced, and there is also an entry interview for each participant. You can leave your comments or questions along with your email address or phone number concerning more information about the courses. CloudSim is a framework for modeling and simulation of cloud computing infrastructures and services. A complete message-oriented middle-ware platform. High quality, enterprise ready messaging; open source and a community of developers and users. Metro is a high-performance, extensible, easy-to-use web service stack. It is a one-stop shop for all your web service needs, from the simplest hello world web service to reliable, secured, and transacted web service that involves .NET services.